Humanity Wake Up Call From An Icon Of The Past - Page 2 - Learning From The Past - Chickensomething What Are You Afraid Of? Looks like his image is still being used in a big way. How many times have you bought an idea or product from a celebrity spokesman? Does the ethos they project reach into the pathos and hypnotize the logos? 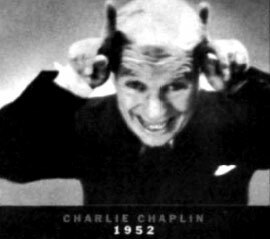 Charlie Chaplin wasn't the only one..
A lot of the old horror movies in the silent era were made by individuals who came back from WW1. The imagery is stark and the story telling techniques reflect the dark visions they encountered during their time in hell. I've heard tales of the famous Lon Chaney from that era. He brought this attitude into his characters on film. Many are horrific in nature. Movies can make us laugh, they can be shocking, and they can make people think in whatever era they come from. It's interesting how much they have evolved since their inception upon society. Of course, the studios would hype their movies to the max. They still do. Including hiring actors to scream and run out of the theater, paying ambulance drivers to show up and run their sirens, and keeping scripts secret almost to the very end...all to build up an artificial hype almost beyond endurance. Humanity has always seemed to be 'modern' when the pride of economics is concerned. This giant machine of industry created over the eons has provided humans with a means to trade with each other en masse. Logically, one can figure that the system could support the basics for all men and women. All the extras can be got with trade. Too bad the few at the top believe they own the whole world and have used the machine dishonestly to support their own beliefs of happiness. Will this machine of precision and quantification be a monument to the demise of all mankind? Not everything runs perfectly. Someone has to go in and do the dirty job when the mechanisms fail. I've heard that consumption is the 'engine' that drives the economy. How can that be? An engine needs to consume to run. A business, corporation, government, a power, an authority, all are pieces in a much bigger engine. Perhaps the engine that runs this economy is too big? Just running it requires too much fuel. It's old, it's antiquated. Those who own this 'engine' don't allow for others outside of their influence to build their own engines. Smaller, more ecological and economically developed engines are hidden away in the secret vault. Secure and unreachable to the public in general. #19 status - Mr. Ranger, Sir! status - Mr. Ranger, Sir! Drug use in athletics: How can we trust the sport?